I’ll tell you a story in my own life about something that’s changed recently. I was—and have been for 62 years—really late for everything. 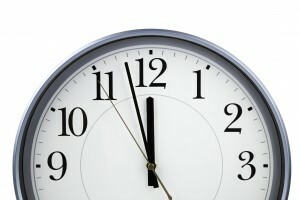 For a very long time, I’ve either been just two or three or four minutes late meeting a friend or going out to dinner. Or I’d be rushed and on time, but before I got there I’d be out of breath so that I arrived in a huffy, puffy, “Oh, I’m so sorry,” kind of way. And there was always an excuse. I got stuck in traffic. The dog threw up. Matt didn’t come home when he was supposed to. Something happened. And I couldn’t ever change that. Because the feeling of being late was bad. That wasn’t enough. It felt awful to be late, but having it feel awful, believe it or not, was not a good enough inspirer to change the pattern of it. So I had to decide what I wanted more. What did I really, really, really want that could actually inspire me to change being late? I found that it wasn’t so much that I was late. It was that I was rushing. And I realized what I really, really wanted was to be relaxed and at ease. I wanted to feel like I have all the time in the world. What would happen instead is I’d know I’d have to go out. And then suddenly, knowing I had to be somewhere at ten, I’d suddenly realize there were five more things I hadn’t done that I had to get done. And they seemed urgent for me to get them done. I had to get them done right now. So I kept sticking in more things that I had to do. Then I’d be on my way, and I would think, oh God, if only I could drop off these pants where they need to be dropped off or pick up that thing that Matt asked me to pick up right now. Finally, I’d get some place and just be completely off center. Even if I did arrive on time, I was off center because I had spent the last hour, or two really, because it started hours ago. It wasn’t just the 20 minutes it took me to get to where I was going. It was the whole lead up before then. So I realized I wanted ease. I wanted relaxation. I wanted to feel centered. I wanted to feel at the center of my own life. I wanted something more than I wanted to feel awful. As a result, I just started counting backwards. I started saying, “Okay, if I want to be there on time, then that means I have to leave here then. And that means I have to start getting ready then. And that means I have to actually feed the dog, do the thing, take the walk, do the yoga, do the blah blah blah.” It was like, oh my God, how does anybody ever get anywhere on time? And then I realized one thing: I’m not going to get it all done. I don’t actually need to get it all done. And in fact, no matter what I get done today, there are going to be ten more things I have to do tomorrow. Life isn’t actually about getting it all done. Because if I somehow got into some horrible accident, or got a terrible disease and died within a month, I wouldn’t have gotten it all done. I would’ve died. And it wouldn’t have been done. And who cares? I would’ve been dead. I wouldn’t care. And then nobody around would’ve cared about what was unfinished on my list. So what? Now, that’s actually quite a distortion right there, but we often just take it to the extreme, really. So then I just started showing up on time. And that’s what a diet feels like. I have to do it. Because I’m bad if I don’t. But it doesn’t have to be that way. Sometimes, it just takes showing up. Just starting to see where the distortions lie. I’ve got most of your books Geneen and the 6 CD collection. I KNOW that everything you say has truth, honesty and wisdom in it, but I’m still overeating. I’ve done all the diet journeys, 12 step programmes- lost the weight intermittantly, and now I’m feeling ashamed, uselesss, like I’m a failure, like I’ll never be able to get through this endless tunnel. I was thinking of doing your online course but my instincts tell me this will just be another time and money wasting exercise. I remember thinking when I was 20, ‘I can’t wait till I get to 40 so this weight issue wont matter’. I’m 62 now!!!! Love, Geraldine. I just finished reading Women Food and God and I LOVED IT!! (I’ve read most of your books and I’ve been to a workshop a long time ago!) But now I’m scared. I am going to try inquiry and the eating guidelines, but I am worried. I am glad to see this website and I will use your books for support. I would love it if your online course was a video course!!! Audio alone just won’t do it for me. Please consider offering a VIDEO course. Geneen, I’ve read all your books and I’ve been wanting for so long to come to one of your retreats, but I struggle with money in addition to weight, and I just can’t swing it. I’ve tried a couple of your CD courses, but audio just doesn’t do it for me. I agree with the comment about doing videos. I can connect so much better with a video and I’d love to be able to do a workshop or retreat or course with you on video. This piece was cogent, weetrw-iltln, and pithy.